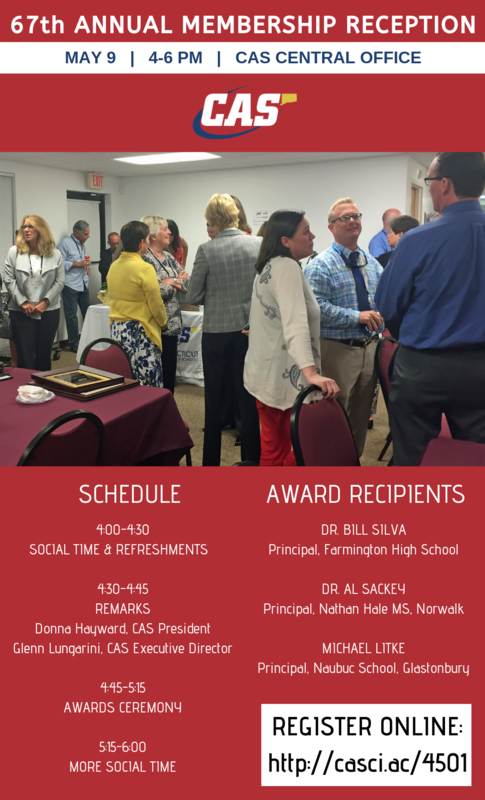 Connecticut Association Of Schools - Serving Students » Don’t Miss End-of-Year Membership Reception! Don’t Miss End-of-Year Membership Reception! CAS will be hosting its annual spring membership reception on Thursday, May 9th, from 4:00-6:00 p.m. While, historically, this had been an event at which we conducted all of the business required by our Constitution – e.g., bylaw changes, budget, Nominating Committee Report, etc. – we have replaced the traditional business meeting with an end-of-the-year celebration and awards ceremony. presentation of CAS Letters of Commendation and CAS Citations. All of the business required by our Constitution will be conducted online again this year. Details on the electronic voting process will be forthcoming in late May. We encourage you to join us on May 9th to celebrate the end of another successful school year and to honor those individuals who have contributed so generously to our work. There is no charge for this event. Register now!